Fiber is an essential part of every horse’s diet. Feeding a minimum of 1 percent body weight in forage per day (dry matter basis) is recommended to supply adequate levels of fiber required for proper gut function. Horses grazing good-quality pasture and/or provided ample access to hay generally have no problem meeting this minimum requirement. However, there are times when good hay is hard to find due to severe drought or other weather patterns. During a hay shortage, hay quality tends to decline along with supply. If affordable, good-quality hay cannot be found locally, it may be possible to source it from outside the region. Another option is to use forage alternatives, which are high-fiber feeds that can safely be substituted for the forage component of a horse’s diet. These feeds can be used to either stretch the available hay supply or completely replace it if necessary. Several Purina® feed products contain the appropriate types and amounts of fiber to effectively serve as forage alternatives (see Table 1). Most of these feed products can easily be found at Purina® feed dealers across the United States and are available year-round. Feeding hay stretchers or complete feeds can be a cost-effective alternative to feeding expensive or poor-quality hay, especially considering the fact that the concentrate portion of the diet can be reduced or eliminated, and there is little to no feed waste compared to hay. In addition to Purina® feed products, there are unfortified forage alternatives available that can be used either as a partial or complete replacement for hay (see Table 2). 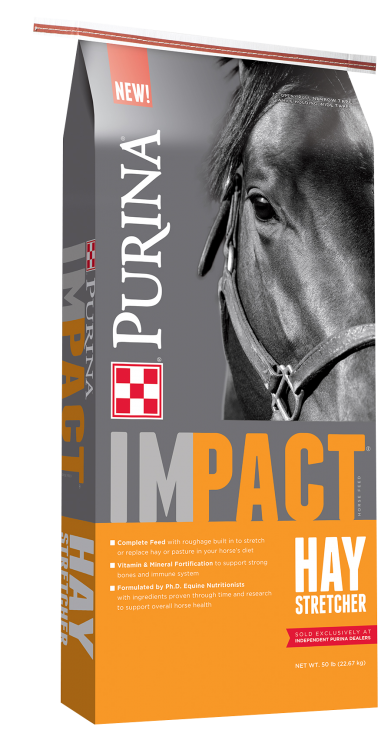 Purina® IMPACT® Hay Stretcher 11.5% protein, for horses 6 months of age and older. Contains fiber sources to replace some or all of the hay and/or pasture in a horse’s ration. Purina® Equine Family Feeds Equine Adult® — 12% protein, for mature, active pleasure horses. Equine Junior® — 14% protein, for weanlings through 2 years of age. Equine Senior® — 14% protein, for aging horses and/or horses with dental issues. These Equine family products are premium, pelleted products with excellent-quality fiber sources and superior nutritional balance. Purina® IMPACT® Senior Horse Feed 14% protein, with adequate roughage built in to help address some of the issues older horses have with chewing or digesting forage. Purina® Omolene #400® 12% protein, for performance horses or hard keepers. Includes loose beet pulp, contains no oats or alfalfa for horses with allergies. Higher-calorie and highly palatable premium product with excellent-quality fiber sources and superior nutritional balance. *Can be used as the sole ration, no additional fortification necessary. See Table 1 for a complete list. To avoid digestive upset, any dietary change should be made very gradually, taking at least 7 to 10 days for a full transition. When using pelleted hay, hay stretchers or complete feeds, it is best to divide the daily ration into three or more meals per day. If the horse has no dental problems, feeding some long-stemmed hay is recommended because it provides some beneficial “chew factor.” A hay shortage can be a challenging time, but taking advantage of the many options available to replace or stretch the current hay supply will help get horses through until the next hay season. This entry was posted on Friday, February 8th, 2019 at 6:26 pm	and is filed under Front Page, Horse, News. You can follow any responses to this entry through the RSS 2.0 feed. Both comments and pings are currently closed.